The Internships 101 Toolkit was created in partnership by LeadLocal and Pima County One-Stop. The toolkit is designed to provide businesses with the tools to create successful youth internship programs. In Pima County, as in many communities across the country, the demand for internships exceeds the supply. While businesses desire to support workforce development and grow local talent, creating meaningful, value-added internships require time and capital investments that many businesses— especially smaller firms—do not have. Businesses need partners and collaborators as well as support establishing internships and recruiting talented interns. This toolkit is designed to give businesses and public sector partners the foundation to develop effective internship support practices that lead to value-added experiences. 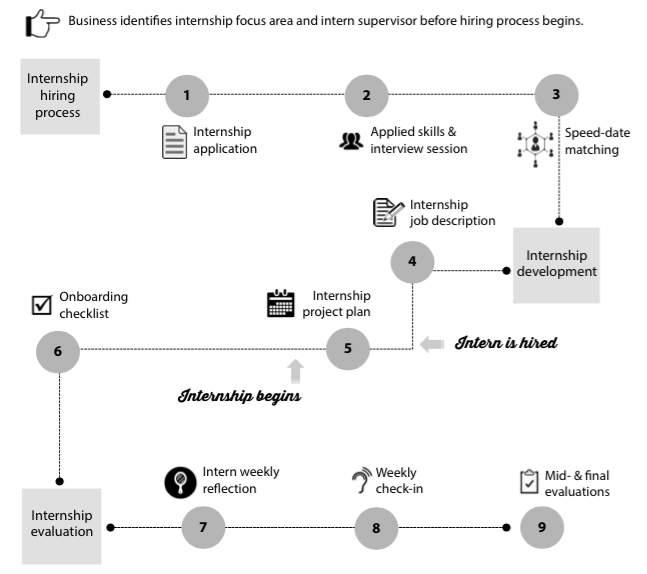 The Internships 101 Toolkit and process is outlined in the following illustration. There are three steps for developing a successful internship: intern selection, intern on-boarding, and internship evaluation. Each of these steps has tools and templates associated. Click on the menu to view tools in each section. With in each section, you will find tool modules which provide a video overview and downloadable information and examples. While the tools are most successful when implemented in the full internship process, they are also adaptable and can be mixed and matched for different business needs. Intern Selection: This page includes an internship application, instructions for group interviews and skills assessments, and a speed date matching process. Intern On-boarding: Included in this section is the internship job description, project plan, and on-boarding checklist. Internship Evaluation: The internship evaluation section includes information on weekly reflection & check-in meetings as well as mid-point & final internship evaluation. Internships require collaborative public/private support systems & motivated interns. Workplace productivity comes from meaningful engagement. These findings were then used to develop the beta version of the toolkit that was piloted by Pima County One-Stop, Tucson Youth Development, and LeadLocal during summer 2014. Seven participating companies who took on nine interns (among them) for a minimum of five weeks (160 hours). The pilot results were positive. Interns made positive contributions and added value for businesses. Businesses found interns’ engagement and learning agility to be outstanding. Businesses noted that a shorter internship or onboarding period would have diminished the positive contributions interns made. And it was these value-added contributions that made the internship worthwhile. The toolkit was refined, adapted and user tested by another team of interns in fall 2014. Then in summer 2015 a team of high school super interns worked to put the toolkit online. Check out the super interns video introduction about themselves!